When Motor Man and I travel through Coinjock, NC on our way to and from the Outer Banks, we cross the bridge over the Albemarle & Chesapeake Canal, which is part of the Intracoastal Waterway. Although the view is nice from either side of the bridge, one side in particular is very picturesque, with waterfront houses, boat slips, a marina and restaurant, so I usually make a point to look in that direction. Normally the boat traffic in the canal is made up of sailboats, motor boats and the occasional yacht. So imagine my surprise on our most recent trip, when I glanced over and saw this. Motor Man made a u-turn and we took the little country road down to the marina, so we could get a closer look at this boat ship. The web-site also states that the Seafair is the fourth largest privately owned yacht in the US, and it cost $40 million dollars to build. 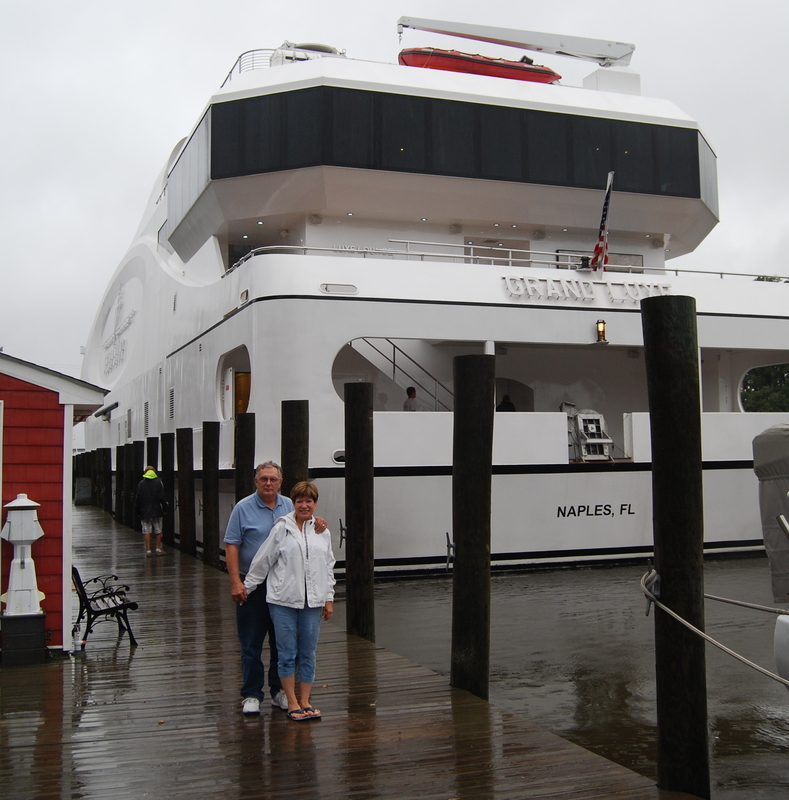 The crewmember told us that the ship was en route from Greenwich, Connecticut to Morehead City, NC, and that conditions on the ocean were so rough, they decided to travel by the inland waterway. Several people at the marina were quite interested in the Seafair, and were all having pictures taken with the ship in the background. You know that Motor Man and I couldn’t pass up that chance. But, believe me, no one mistook us for the owners. 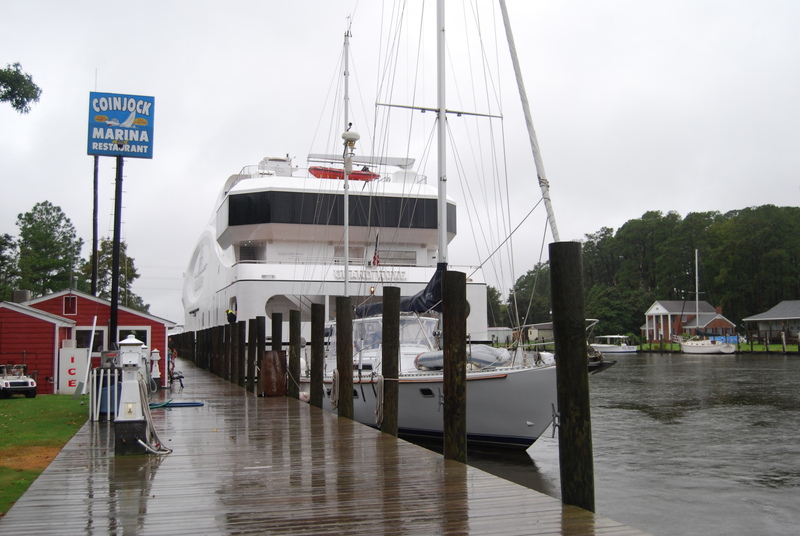 This entry was posted in Traveling Days and tagged albemarle and chesapeake canal, coinjock nc, seafair. Bookmark the permalink. Glad to hear the Swamp fires didn’t delay their trip. Had no idea a ship that large could navigate the Waterway through the Swamp! That is really interesting! It is a beautful ship. I can only imagine what the inside must look like. What a gorgeous ship….and what a way to travel. I guess the seas have been a bit tough for ANY size boat with all the rain/storms. How cool that you and MM got to see it there and have your picture taken with it as a backdrop! That is a big ship….just seems like it couldn’t possibly be safe to be where it was though. Glad you did the research and talked to the crew! Interesting. I love the picture of you and Motor Man and how he is touching you….you are very loved! Yep…not a sail boat, motor boat, not a canoe, kayak or jet ski…What fun to find this by chance. You do venture out. how interesting to have such a large vessel only require minimal water depth. i’d have taken a second look too! Wow, not that’s why I call a ship, a really expensive one. Wouldn’t it be cool to be a captain of such a fine vessel? That big ship is a beauty! It would be fun to see what it looks like on board. ooooohhhhh how i love u-turns!! i would have tried to get on that baby!! (wink)!! Wow, putting yourselves in the picture shows how large that ship really is. 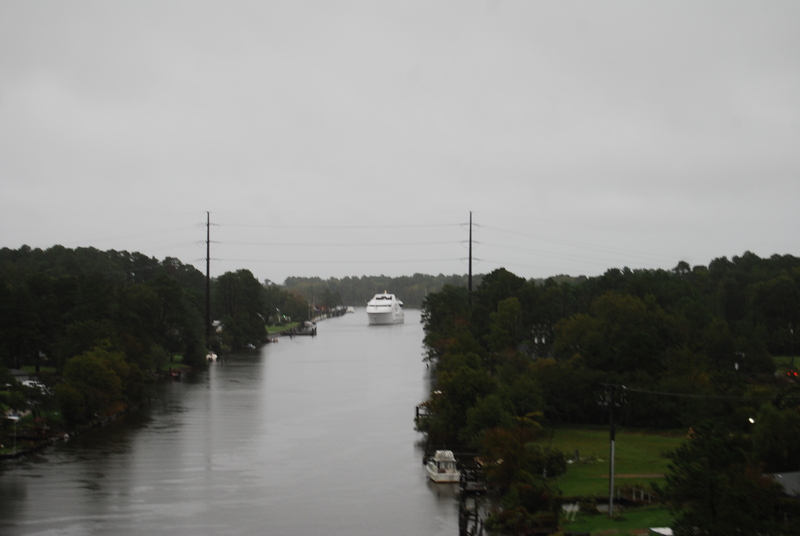 It makes the Intracoastal Waterway look like a one-lane road! How amazing that you had the opportunity to see it up close. That’s one big yacht! And to think it can navigate in no more water than that! The shot of the building next to it just emphasizes the enormity of that ship – good job! That’s what I call a boat! 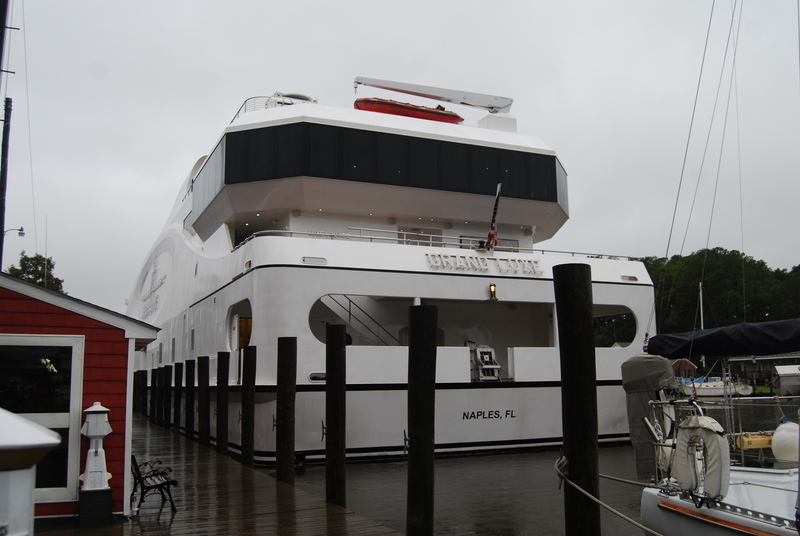 I’m with Marshall, I bet the inside is to die for.